Just this past week we found out that U.S. employers added the fewest jobs in May in nearly 6 years. Non-farm payrolls came in a +38K vs the +164K average economists were expecting (lowest coming in at +90K). As many market participants were forecasting for the next rate hike from the Federal Reserve in the near future, following the dismal May jobs reports the Fed Fund futures probability dropped from 34% to 3.8% for June. The odds of a 25 to 50 basis point increase for July stands at 31.3%. Now that Janet Yellen and the other Federal Reserve members are likely to hold off on a move closer to normalization in interest rates for the time being, how can traders and investors position themselves? One area to consider is in the higher yielding assets/sectors (high yield corporate debt, consumer staples, and utilities). Consumer staples and utility stocks have acted as bond equivalents due to the search for yield among investors, so I wouldn’t expect a large rotation out of these groups anytime soon. 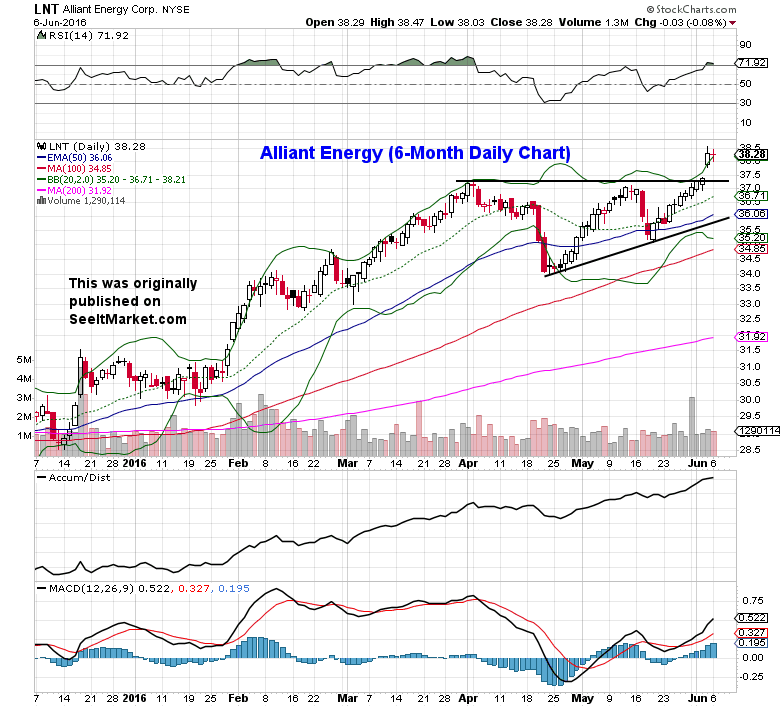 Below I take a look at 4 U.S. utility stocks that could see additional gains later this summer. Note that these weren’t the first tickers in the sector I came across. Criteria to shrink the more than a dozen candidates were: forward P/E ratio under 20x, 3%+ dividend yield, projected top and bottom line growth in the next 2 years, market capitalization above $5B, and a breakout to new highs on Friday, June 4th. Want to get our latest investing research and trading ideas? Sign up here. DTE Energy shares gapped above the $91-$92 resistance level on Friday and were able to add to those gains by the close. A move to the key psychological level of $100 in the next few months isn’t out of the question. DTE fundamentals: trades at a forward P/E ratio of 17.65x (2017 estimates), price to sales ratio of 1.65x sales, and 1.84x book value. The company pays a 3.20% dividend (next ex-dividend date is June 16th). The $8.5B electric utility stock took out the previous highs in early April; resolving above the bullish ascending triangle (measured move to $40+ in the near-term). Alliant Energy fundamentals: trades at a forward P/E ratio of 19.06x, price to sales ratio of 2.65x, and 2.26x book value. The company pays a 3.14% dividend. On the fourth try shares of Pinnacle West Capital were finally able to breakout above consolidation in the $70-$75 range, which sets up for continuation to $80 later this year. PNW fundamentals: trades at a forward P/E ratio of 18.04x, price to sales ratio of 2.36x, and 1.79x book value. The company pays a 3.37% dividend. The largest of the 4 featured utility companies, PPL Corp, is the more consistent of the group (slow and steady). Because of this pullbacks to the 50-day exponential moving average have been the optimal buy points in the previous months. PPL fundamentals: trades at a forward P/E ratio of 16.11x, price to sales ratio of 3.50x, and 2.67x book value. The company pays a dividend of 3.94% (next ex-dividend date is June 8th). PPL has the lowest valuation and highest yield of the group. Other utility stocks to watch (meet most, but not all of my screening requirements) include: CMS Energy, NextEra Energy, PG&E, Sempra Energy, and WEC Energy Group. The author does not hold a position in mentioned securities at the time of publication. Any opinions expressed herein are solely those of the author, and do not in any way represent the views or opinions of any other person or entity.